BLACE, Macedonia (CNN) -- Macedonia's reopened border drew barely 70 people on Thursday, allowing the country more breathing room as it struggles to absorb tens of thousands of refugees. The border had been closed for a week, allowing Macedonian officials and international relief agencies to move thousands of displaced Kosovars out of the country's seven refugee camps. A total of 2,484 refugees left Macedonia on Wednesday under a humanitarian evacuation program, bringing the total departures to more than 43,000, the U.N. High Commissioner for Refugees said Thursday. The few new arrivals at Blace spoke of severe food shortages among the remaining ethnic Albanians in Kosovo. They also told of a heavy police presence in the province, with Serb shopkeepers refusing to sell food to ethnic Albanians. One refugee, Selvete Hasani, said police have raided food stocks of one aid program. Hasani added that ethnic Albanians still in Kosovo are on the run, or remain locked in their homes all day. They send children out in the evening to neighbors to see what food stocks they can share. Refugees can track the progress of the war in their homeland by listening to Albanian-language radio in the camps -- or by watching overhead for the contrails of NATO aircraft and cruise missiles streaking into Yugoslavia. 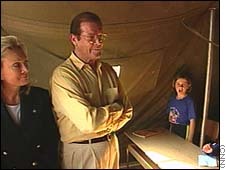 Relief workers at Macedonia's Stenkovec refugee camps were joined Thursday by actor Roger Moore, now a U.N. Children's Fund goodwill ambassador trying to raise money for refugee relief. The former star of the James Bond movies was mobbed by crowds as he visited the Stenkovec II camp and its UNICEF-run school, which try to accommodate more than 1,000 Kosovar children. "What we see, we can go out and talk about," he said. "We can ask people to dig a little deeper into their pockets." Moore was the latest celebrity to visit the camps on a goodwill mission: Other visits have brought such personalities as Vanessa Redgrave, Bianca Jagger and Richard Gere. The estimated number of refugees and displaced people in the region is more than 748,000, including more than 234,000 in Macedonia; 431,000 in Albania; and 64,000 in Montenegro, UNHCR said. In Albania, thousands continued to cross the Yugoslav border from Kosovo. Many had spent weeks in the surrounding mountains, aid workers said. About 4,000 entered Albania on Thursday. UNHCR officials were trying to convince refugees to move into the Albanian interior rather than remain in camps like the one at Kukes, near the border. "We need to put you in another camp where it's safe," U.N. special envoy Dennis McNamara told one woman. A translator passed along McNamara's warning, then told him, "She says she'll go if everyone else goes." 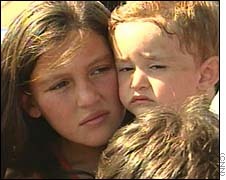 Her response was typical of many at Kukes, who wish to remain near their homes despite the danger posed by possible Yugoslav incursions and artillery shells. 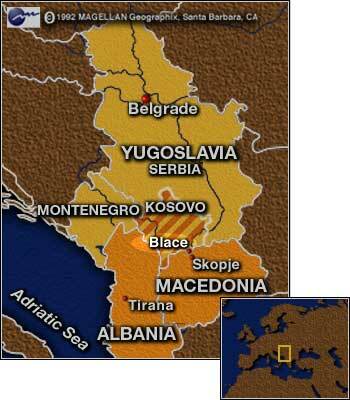 The refugees reported recent heavy fighting between Serb forces and the Kosovo Liberation Army, the ethnic Albanian rebel group which wants independence for the Serbian province. Clashes between KLA guerrillas and Yugoslav army troops have spilled across the border as well. Correspondents Tom Mintier and Rusty Dornin and Reuters contributed to this report.